We’ve updated, improved and streamlined Intervals to do more and do it efficiently. This November update adds workflows for creating people and contacts, RSS feeds on the home page calendar, incremental options for rounding up time, changing the order of line items on invoices, and a search for closed tasks by date closed. These most recent features and improvements are more than just another iteration of our online time, task and project management software — they are part of our commitment to continually improve Intervals. To try these features out, log in to your Intervals account, or sign up for a free and fully functional 30 day trial. When creating accounts for people to log in, Intervals requires more than just a name and an email address. The person being created must be given an access level, which determines the availability of project and task information they can view and edit. In addition, the person must also be granted access to the specific projects they will access. This last step has presented a small challenge in the past, because it was not apparent that project access was required for a person to login. So, we’ve made the process of creating a person more linear, providing a three step workflow to make the final step of granting project permissions more intuitive. What about contacts? If you are just adding basic contact information to Intervals, only the first step is required. Once you’ve filled out enough information about the person, click on the “Save as a contact” button instead of going to the next step. RSS feeds are a great way to deliver time sensitive information without requiring you to login to Intervals. Using a desktop RSS reader or a web browser, subscribe to RSS feeds based on your home page calendar. And it’s completely flexible. Create RSS feeds unique to the each filterable configuration on your home page calendar. For example, you could subscribe to an RSS feed for all tasks coming due for a given project, or a feed for all public notes added by your team. There is simply no limit to the different types of RSS subscriptions. For more help on this topic, please read our forum post on How to Add your Project RSS Feed to FeedReader. Intervals has always provided the option to round time entries up to 1/8th of an hour when applying a timer. That’s a point-one-two-fiver for those familiar with tracking time in the decimal format. But not everyone tracks or bills their time in 1/8th of an hour increments. There are some creative agencies that bill in quarterly increments of an hour, some web design and development shops that bill in half hour increments and some firms that bill in 1/10th of an hour increments. Now you can choose what increment to use when rounding up your time entries from your timers. Just log in to your Intervals account and go to Options -> Settings & Defaults to change it from 1/8th of an hour. Ever wondered which tasks, and how many of them, your team completed last week? Now you can quickly pull up a list of tasks based on the date they were closed. Click on the “Advanced Search” link in the dock of your Intervals account to utilize this feature. In addition to specifying search terms, assignees, and other criteria, you can also instruct Intervals to search for tasks closed in a given date range. When searching by the date a task was closed, this information will be included in the search results. The ability to search for tasks that were closed in a specific date range is a feature with several different applications. 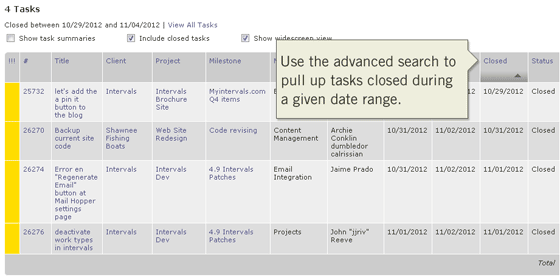 Find out which tasks were part of your last software release by pull up tasks that were closed on the date of the launch. Gauge the efficiency of your web design and development team by the number of tasks they closed last month compared to the month prior. Provide your client with a progress report showing them recently closed tasks. These are just a few examples of how this feature might benefit you. Entering line items on an invoice breaks down billable work to make it easier to tally up totals at a glance and provide clients with answers to any questions they might have. Many of our customers have shared that it would be helpful to change the order of these line items when creating a freeform invoice. The line items may correspond with different dates, or they may be grouped by similarity, or any other number of reasons. 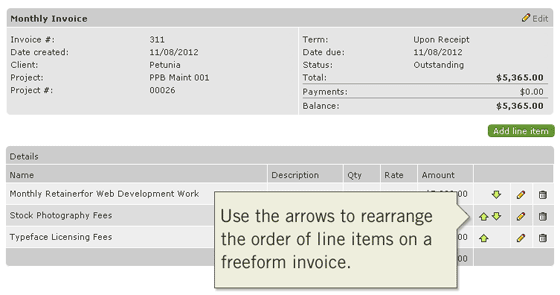 The ability to reorder line items on a freeform invoice gives you the control to determine how invoices are organized. These are just a few of the noteworthy updates for this release. We’ve also fixed some bugs and made several optimizations, including some speed optimizations to the reports. Please feel free to send us any comments, questions, or criticism, by clicking on the “General question?” link at the bottom of any page from within your account. We’d love a shout-out. Incremental Options for Rounding Up Time Entries? You just made my week. Thanks for listening to our suggestions!!! Ordering on invoicing = awesome tweak.